One of the most popular providers of software and games for internet casino sites is Net Entertainment. This Swedish games developer has been around since 1996 and they had their first casino up and running by 2000. Their exciting range of slots games is one of the highlights of their packages, with new titles brought out on a regular basis. However, their overall casino package is strong, with over 70 casinos using them at the time of writing. While Net Entertainment started out running their own casinos back in 2000 then now focus solely on providing a platform for other casino operators to use. Since they offloaded their own casino network in 2005 they have gone from strength to strength as a provider of games to third parties. In 2006 their casino platform was ranked in the top twenty in the industry and the following year they brought out some of the most innovative slots seen up to that point, which helped move their business onto the next level. Net Entertainment currently enjoys an enviable reputation for providing high quality, visually impressive games and a solid, reliable gaming platform. 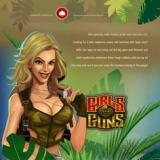 The outstanding aspects of this developer’s online casino games are its range of top quality instant play slots games. Among these are hugely popular titles such as Gonzo’s Quest, Starburst and Hall of Gods. Net Entertainment remains one of the most prolific suppliers of games around and the latest title to roll of their production line is South Park. Their overall portfolio of games stands at over 100, with about half of them being slots. Some of these games can be played in the form of free tournaments as well. Their range of table games is good, with classics like Roulette and Blackjack covered in a number of variants. There is no need to download any software to play any of the company’s games, as they are all instant play Flash titles. Their platform supports 22 languages and a wide range of different currencies too. Their mobile casino for iOS devices is also regarded as being among the most impressive around, with new games being added on a regular basis since the launch of it under the name Net Ent Touch in late 2011. The gaming license held by Net Entertainment was issued in Malta and their new games are all passed through the Lotteries and Gaming Authority for approval before release. To ensure that their casino software offers a sufficient degree of randomness it has been verified by a couple of different independent companies in difference countries (Sweden and Canada). The company has publically declared that they operate a high pay out strategy, with their pay out rate being around 95%.